Classic BBC sitcom about the last human being alive, his dead bunkmate and their companions (an evolved cat, a computer of debateable intelligence and a downtrodden android). Series 1-6 are completely brilliant, Series 7 is hit and miss with more misses than hits, Series 8 contains exactly one good joke and the recent mini-series was... interesting. 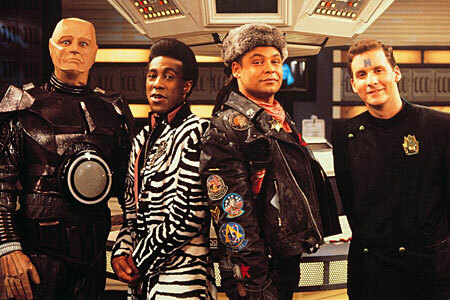 My first ever full post on the blog was on Red Dwarf, so I think it deserves its own page! One Of The Funniest British TV Shows I've Ever Seen! The Android Character Was The Best In The Show. I Always Looked Forward To Watching This Show Late At Night Before Turning In. It Would Be Nice To See Some Reruns! I absolutely love the moment where Death comes for Rimmer and he snaps 'only the good die young' and knees Death in the balls. It was almost worth sitting through Series 8 for!